You know how Yoruba moms would always advice, "ma fi boyfren se oko, o ni fi oko se boyfren o. "and you have to say amin? That is a very valid prayer. However, how can you really know if this bloke you're dating has yards of husband material? How can you tell? Well, let’s help ourselves out today and measure if that guy is made for marriage or just a "chewingum boyfren". 1. He’s About The Future: A man that makes plans for the future that includes you is someone that is thinking ahead. You definitely want someone that is just not wishing, but making efforts to build a future that he sees you to be a part of. If all your boyfriend is concerned about is this very jaiye-jaiye moment , then you have to do a rethink. Is he saving? Is he working for his future? Is he making plans? Are you aware of those plans? Are you a part of those plans? 2.. He’s A Fixer: I’m not just talking about fixing the broken door, changing the light bulbs. When you fight does he fight fair? Is he a voice of reason or are you the one always begging whether you are right or wrong and forever patching things up? Husband material is a fixer, and will do his best to make sure everything works. 3. He’s Interested: You can tell he’s got yards of husband material if he’s interested in your career, your hobbies, your activities. A man that is interested will always ask about your welfare, sometimes may help you with your assignments, will help you restructure your CV so you can apply for that job you desire. He’s interested in your interests. 4. He Invests:That guy will put his money where his mouth is. We are aware that sugar daddies invest money in their sugar babies but when we are talking about husband material, he will invest emotionally, spiritually, financially and every other “lly” in you. People don't play mago-mago with their investments, you can't invest somewhere and run off...so you need to really take some time out for reflection, what has he invested in you? 5. You Agree: Even the Bible asked if two can walk together unless they agree, do you both share the same values, beliefs? You need to be able to connect on the same level spiritually, mentally, emotionally to be able to live in bliss together forever. Ask him about his goals, do you think you can support him? 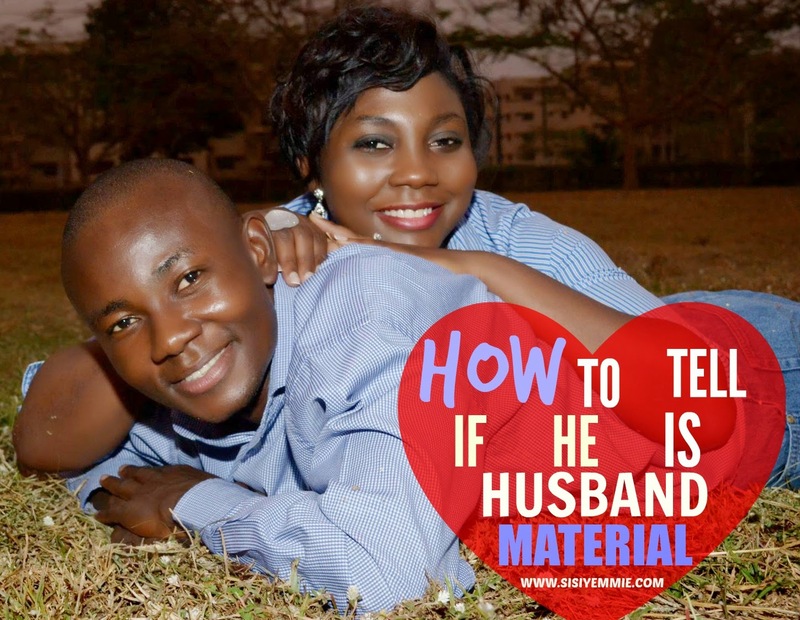 He can be husband material but may be made of a different fabric, perhaps Ankara for someone else and you are looking for French-laced–husband-material…you see? So if you disagree more often than being in agreement, then you might want to measure his yard. What other ways do you think ladies can be able to determine if their chairman is husband material? Spot on! Especially he's about the future and he invests one. Does he love you? I feel a man shows he's husband material if he not only tells you how much he loves you but shows you how much. Nice one! I loved every bit of it. Whaoooo know dis faces re dy ur fwend? Nyce write up every tin mk sense. Totally unrelated but I know this man! The investment part got to me. Very necessary !! Sisi, U are so right especially abt a guy being interested in your development. Had dis guy who was asking me out for a while, dude never bothered to ask about my job interviews and the way they went. He wld just ask "how far with the job search" that was all no further questions, couldn't even ask for my cv to help me structure it properly or something. Have you considered submitting your articles to magazines ? too on point! You are so on point esp on no. 2 and 3. Keep it up.